HealthGear is a real-time wearable system for monitoring, visualizing and analyzing physiological signals. 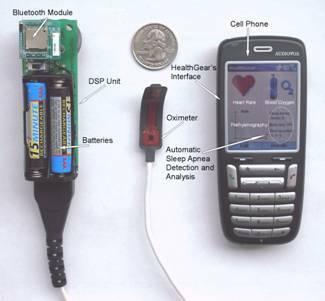 HealthGear consists of a set of non-invasive physiological sensors wirelessly connected via Bluetooth to a cell phone which stores, transmits and analyzes the physiological data, and presents it to the user in an intelligible way. We have developed a first prototype using a blood oximeter to monitor the user's blood oxygen level and pulse while sleeping. We have developed two different algorithms for automatically detecting sleep apnea events, and we have evaluated the performance of the overall system (HW and SW) in a sleep study with 20 volunteers.